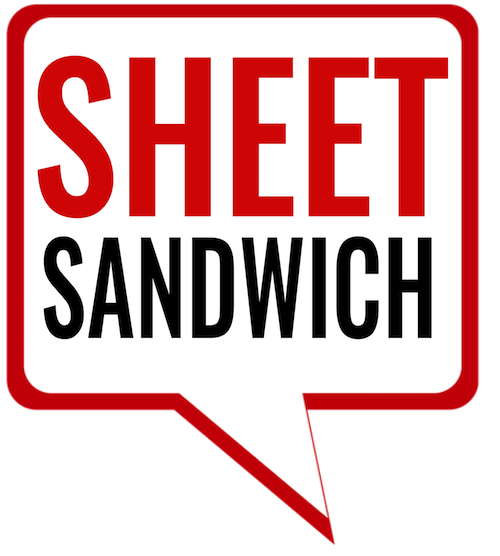 After being out of action for a little more than a month, this website bounded back with all the poise of a Sid Vicious promo. 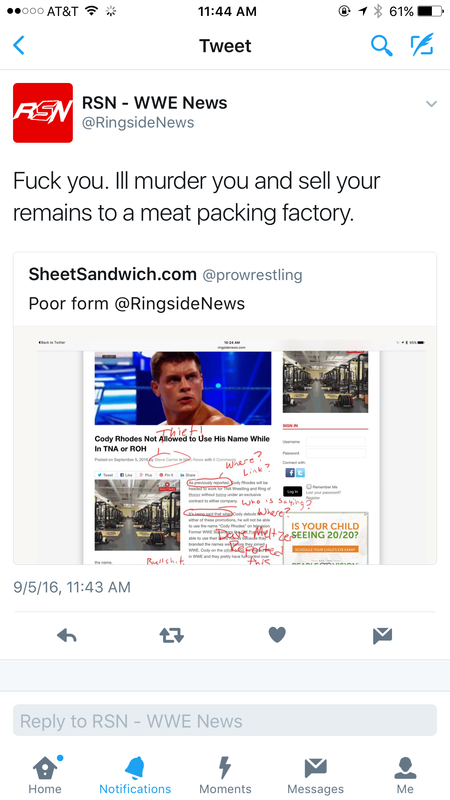 It all started early on Monday morning when I listened to Wrestling Observer editor Dave Meltzer talk about the latest Cody Rhodes news. 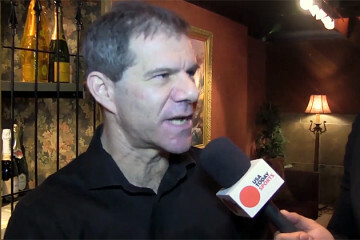 Rhodes had just appeared over the weekend at Pro Wrestling Guerilla’s Battle of Los Angles, which Meltzer had attended, and he’d had the opportunity to talk to Rhodes. Meltzer would go on to report a few things that about Rhodes. 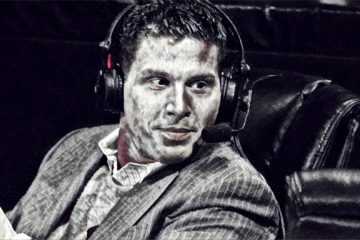 Speaking on his Wrestling Observer Radio podcast, the WON editor said that Cody Rhodes will be appearing soon for not only Ring of Honor, but TNA as well. These are not contractually signed agreements, which I guess means Rhodes is free to work for whomever he chooses. He also mentioned that, because these appearances would be televised, Rhodes (real name Cody Runnels) would not be able to use the Cody Rhodes name. Predictably, Meltzer’s statements immediately became fodder for the morning’s headlines on many other news sites. PWMania even reported that he was signed to appear for TNA despite a paragraph later writing that Rhodes is not signed to either TNA or ROH, but that’s a different story altogether. 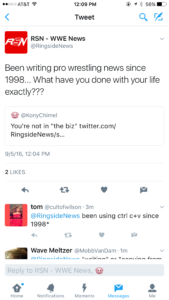 Most of these sites did the customary “right thing,” and credited the story back to Meltzer, either by mentioning him as the source, and/or by providing links back to F4Wonline.com. 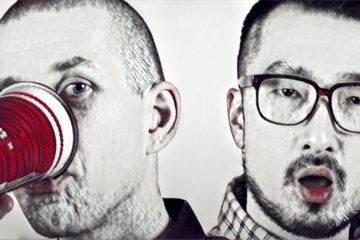 One site, however, failed to do either, and wrote a story so misleading that I took to one of my favorite tools—the iPad Pro—to illustrate my qualms with the story. 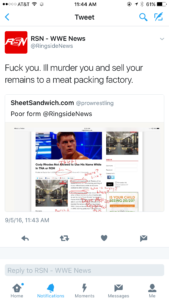 Ringside News did not take very well to this expression of dissatisfaction on my part and threw civility and caution to the wind to let everyone know just how seriously he takes all of this. The writer, who was very proud and keen to point out that he’d been writing wrestling news since 1998, is apparently no stranger to these types of bizarre, public meltdowns as he also apparently has made anti-Semitic remarks in the past and, just last year, sent harassing messages to Seth Rollins over the WWE Superstar’s so-called Peengate. 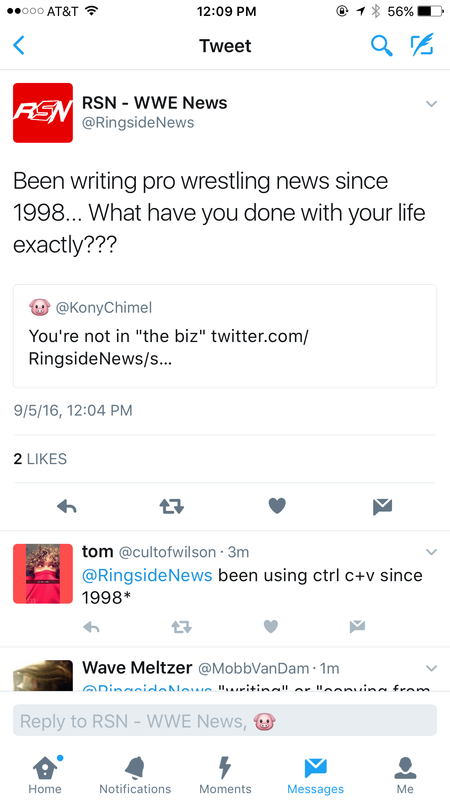 Clearly a case of a wrestling news writer being out to lunch.